Have been held up with getting the second lot of the Little Friends Picture Story Books ready for the publisher. I blame my husband who nicely shared his cold and bad cough with me. Arrgghhhh!! Anyway on the mend now and have got the final drafts ready so they will be off to the publisher in the next week. Looking forward to seeing them in print as I have used a new illustrator for this lot. I've also been enjoying the glorious sunshine down here on Cardiff Bay. And am getting involved with the local community. 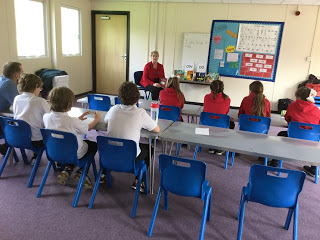 Two weeks ago I attended a local primary school where the children's writers group interviewed me. They asked me quite a varied selection of questions and interacted with me really well. The last being unusual - What is my most embarrassing moment? I had to laugh as I had a problem trying to remember one. Finally told them I couldn't remember and to put it down to my age and selective memory!! It worked. Have also been attending a couple of events with the SCWBI Group that I am a member of. The last one was a workshop with a local writer/teacher who gave good advice on writing. Very interesting session. Got a few things in the pipe-line now for the next few weeks and am collaborating with someone about writing a serious of stories so exciting times ahead.